A heated national conversation about birthright citizenship and the 14th Amendment is currently underway, with many politicians, pundits, and scholars on both the right and left getting it wrong. Claremont Institute scholars have been thinking and writing about this problem for many years. 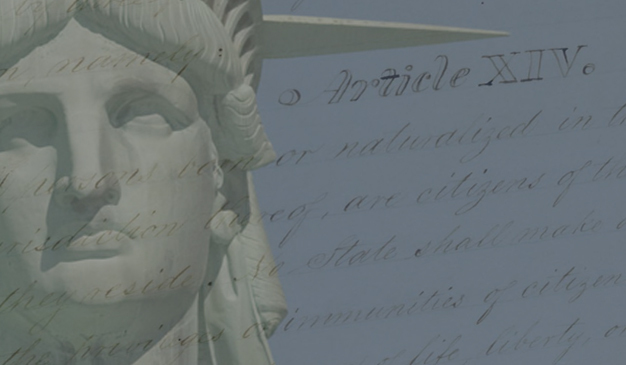 Below we've collected recent and past writings to provide some guidance on the relation between constitutional principles, citizenship, and immigration policy. "We can Apply the 14th Amendment While also Reforming Birthright Citizenship"
"Born in the U.S.A.? Rethinking Birthright Citizenship in the Wake of 9/11"
"Dr. John Eastman on Birthright Citizenship"
The Federalist Society hosted a debate between John Eastman, founding director of the Claremont Institute's Center for Constitutional Jurisprudence, and John Yoo,Emanuel S. Heller Professor of Law at the University of California Berkeley School of Law, on whether the 14th Amendment mandates birthright citizenship. Claremont Institute Senior Fellow Edward J. Erler wrote this short summary of the meaning of the citizenship clause of the 14th amendment for The Heritage Foundation's Guide to the Constitution. Frequent Claremont Review of Books contributor and summer fellowship faculty member Richard Samuelson provides more historical and legal context in his essay for The Federalist: "Birthright for Whom?" In the fall 2013 issue of the Claremont Review of Books, we hosted a symposium on immigration and American exceptionalism, featuring contributions by former Secretary of Education William J. Bennett, former Secretary of Labor Linda Chavez, Ethics and Public Policy Center Senior Fellow Stanley Kurtz, and Claremont Institute Senior Fellows Angelo Codevilla and Edward J. Erler. Finally, for a broader perspective, including how the Founders thought about the question of immigration and how our understanding has changed, we encourage you to buy a copy of The Founders on Citizenship and Immigration: Principles and Challenges in America, featuring the scholarship of Claremont scholars Edward J. Erler, John Marini, and Thomas G. West.